The term Third World arose during the Cold War to define countries that remained non-aligned with either NATO, or the Communist Bloc. The United States, Western European nations and their allies represented the First World, while the Soviet Union, China, Cuba, and their allies represented the Second World. This terminology provided a way of broadly categorizing the nations of the Earth into three groups based on social, political, cultural and economic divisions. The Third World was normally seen to include many countries with colonial pasts in Africa, Latin America, Oceania and Asia. It was also sometimes taken as synonymous with countries in the Non-Aligned Movement. In the dependency theory of thinkers like Raúl Prebisch, Walter Rodney, Theotonio dos Santos, and Andre Gunder Frank, the Third World has also been connected to the world economic division as "periphery" countries in the world system that is dominated by the "core" countries. Due to the complex history of evolving meanings and contexts, there is no clear or agreed-upon definition of the Third World. Some countries in the Communist Bloc, such as Cuba, were often regarded as "Third World". Because many Third World countries were extremely poor, and non-industrialized, it became a stereotype to refer to poor countries as "third world countries", yet the "Third World" term is also often taken to include newly industrialized countries like Brazil, India and China (see also: BRIC). Historically, some European countries were non-aligned and a few of these were and are very prosperous, including Ireland, Austria, Sweden, Finland, and Switzerland. Over the past few decades since the fall of the Soviet Union and the end of the Cold War, the term Third World has been used interchangeably with the least developed countries, the Global South, and developing countries to describe poorer countries that have struggled to attain steady economic development, a term that often includes "Second World" countries like Laos. This usage, however, has become less preferred in recent years. French demographer, anthropologist and historian Alfred Sauvy, in an article published in the French magazine L'Observateur, August 14, 1952, coined the term Third World, referring to countries that were unaligned with either the Communist Soviet bloc or the Capitalist NATO bloc during the Cold War. His usage was a reference to the Third Estate, the commoners of France who, before and during the French Revolution, opposed the clergy and nobles, who composed the First Estate and Second Estate, respectively. Sauvy wrote, "This third world ignored, exploited, despised like the third estate also wants to be something." He conveyed the concept of political non-alignment with either the capitalist or communist bloc. The "Three Worlds Theory" developed by Mao Zedong is different from the Western theory of the Three Worlds or Third World. For example, in the Western theory, China and India belong respectively to the second and third worlds, but in Mao's theory both China and India are part of the Third World which he defined as consisting of exploited nations. Third Worldism is a political movement that argues for the unity of third-world nations against first-world influence and the principle of non-interference in other countries' domestic affairs. Groups most notable for expressing and exercising this idea are the Non-Aligned Movement (NAM) and the Group of 77 which provide a base for relations and diplomacy between not just the third-world countries, but between the third-world and the first and second worlds. The notion has been criticized as providing a fig leaf for human-rights violations and political repression by dictatorships. 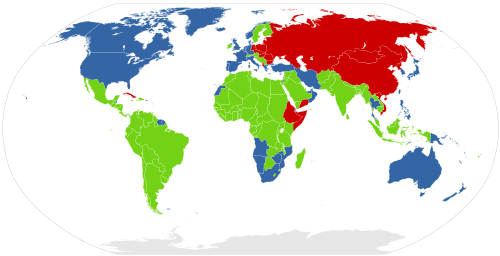 During the Cold War, unaligned countries of the Third World were seen as potential allies by both the First and Second World. Therefore, the United States and the Soviet Union went to great lengths to establish connections in these countries by offering economic and military support to gain strategically located alliances (e.g., United States in Vietnam or Soviet Union in Cuba). By the end of the Cold War, many Third World countries had adopted capitalist or communist economic models and continued to receive support from the side they had chosen. Throughout the Cold War and beyond, the countries of the Third World have been the priority recipients of Western foreign aid and the focus of economic development through mainstream theories such as modernization theory and dependency theory. However, despite decades of receiving aid and experiencing different development models (which have had very little success), many Third World countries' economies are still dependent on developed countries, and are deep in debt. There is now a growing debate about why Third World countries remain impoverished and underdeveloped after all this time. Many argue that current methods of aid are not working and are calling for reducing foreign aid (and therefore dependency) and utilizing different economic theories than the traditional mainstream theories from the West. Historically, development and aid have not accomplished the goals they were meant to, and currently the global gap between the rich and poor is greater than ever, though not everybody agrees with this. Some scholars argue the problem of development amongst many third world states through socioeconomic perspectives which study how individuals form organizations amongst each other for all kinds of goals, such as economic matters. Scholars like North and Weingast claim that modern states are composed of natural states and open access order states whereby open access order states have more positive development than natural states, because in these states, legally binding institutions (rules of the game, customs) allow individuals to freely form impersonal organizations that can attract a large group of people who work or compete with each other economically. The more competition, the more wealth and growth is created. Examples of open access states are many Western countries like America and Germany. In contrast, a natural state (which compromises much of the third world) consists of political elites who try to protect their special privileges by restricting access to the ability to form organizations amongst individuals. These elites must rely on personal communication and the threat of violence to both maintain order and recruit "desirables" into the organizations. Such a set-up not only weakens good governance (as leaders are less accountable) but also leads to weak institutions, where peace is not always assured, as those in control of the means to inflict violence simply restrain themselves out of trust or loyalty, and can easily resort to violence, as has happened in the past (e.g., Biafra against the rest of Nigeria, Bangladesh against the rest of Pakistan). Over the last few decades, global population growth has largely been focused in Third World countries (which often have higher birth rates than developed countries). As populations expand in poorer countries, rural people are flocking to cities in an extensive urban migration that is resulting in the creation of massive shanty towns and slums. Many times there is a clear distinction between First and Third Worlds. When talking about the Global North and the Global South, the majority of the time the two go hand in hand. People refer to the two as "Third World/South" and "First World/North" because the Global North is more affluent and developed, whereas the Global South is less developed and often poorer.To counter this mode of thought, some scholars began proposing the idea of a change in world dynamics that began in the late 1980s, and termed it the Great Convergence. As Jack A. Goldstone and his colleagues put it, "in the twentieth century, the Great Divergence peaked before the First World War and continued until the early 1970s, then, after two decades of indeterminate fluctuations, in the late 1980s it was replaced by the Great Convergence as the majority of Third World countries reached economic growth rates significantly higher than those in most First World countries". Others have observed a return to Cold War-era alignments (MacKinnon, 2007; Lucas, 2008), this time with substantial changes between 1990–2015 in geography, the world economy and relationship dynamics between current and emerging world powers; not necessarily redefining the classic meaning of First, Second, and Third World terms, but rather which countries belong to them by way of association to which world power or coalition of countries — such as G7, the European Union, OECD; G20, OPEC, BRICS, ASEAN; the African Union, and the Eurasian Union. 1 2 3 4 5 Tomlinson, B.R. (2003). "What was the Third World", Journal of Contemporary History, 38(2): 307–321. 1 2 Gregory, Derek et al. (Eds.) (2009). Dictionary of Human Geography (5th Ed. ), Wiley-Blackwell. ↑ Wolf-Phillips, Leslie (1987). "Why 'Third World'? : Origin, Definition and Usage", Third World Quarterly, 9(4): 1311-1327. ↑ Pithouse, Richard (2005). Report Back from the Third World Network Meeting Accra, 2005. Centre for Civil Society : 1-6. ↑ "First, Second and Third World"
1 2 Westra, Richard (2011). “Renewing Socialist Development in the Third World”, Journal of Contemporary Asia, 41(4): 519-543. ↑ North, D.C; Wallis, J.J; Weingast, R. (2009). Violence and social orders a conceptual framework for interpreting recorded human history. New York: Cambridge University Press. p. 11. 1 2 North, D.C; Wallis, J.J; Weingast, R. (2009). Violence and social orders a conceptual framework for interpreting recorded human history. New York: Cambridge University Press. p. 18. ↑ North, D.C; Wallis, J.J; Weingast, R. (2009). Violence and social orders a conceptual framework for interpreting recorded human history. New York: Cambridge University Press. p. 21. ↑ Mimiko, Oluwafemi (2012). "Globalization: The Politics of Global Economic Relations and International Business". Carolina Academic Press: 49. ↑ Phases of global demographic transition correlate with phases of the Great Divergence and Great Convergence. Technological Forecasting and Social Change. Volume 95, June 2015, Page 163.